Spiced nuts are classic. I mean, I can remember a bowl of spiced nuts forever resting on my grandparents basement bar. When I started going to pubs and clubs (MANY moons ago) spiced nuts always adorned the bar, in an effort to inspire more drinking- let’s ignore the petri dish angle that still gives me nightmares. Nonetheless, spiced nuts are classic but are easily made new with fresh interpretations of spices and garnishes. 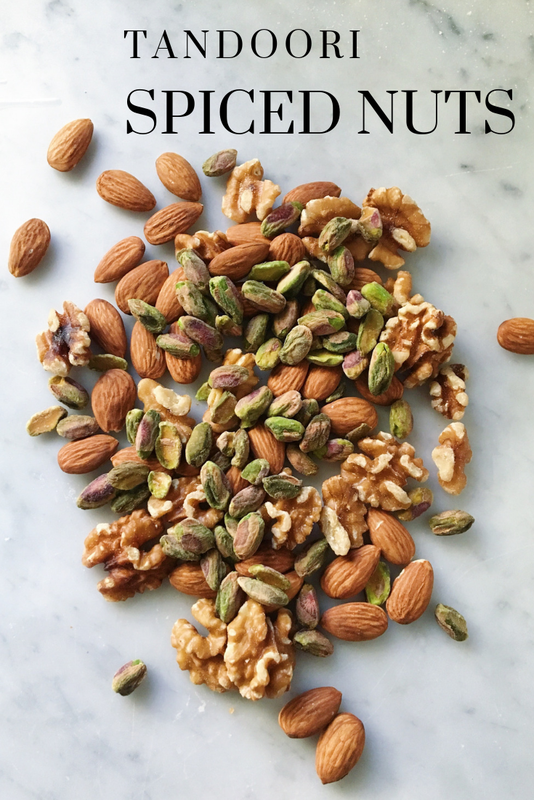 Not to mention spiced nuts are phenomenal because they can be made ahead and stored with ease in the freezer for months (hello meal prep), they are an excellent snack or better yet a garnish on soup or salad. 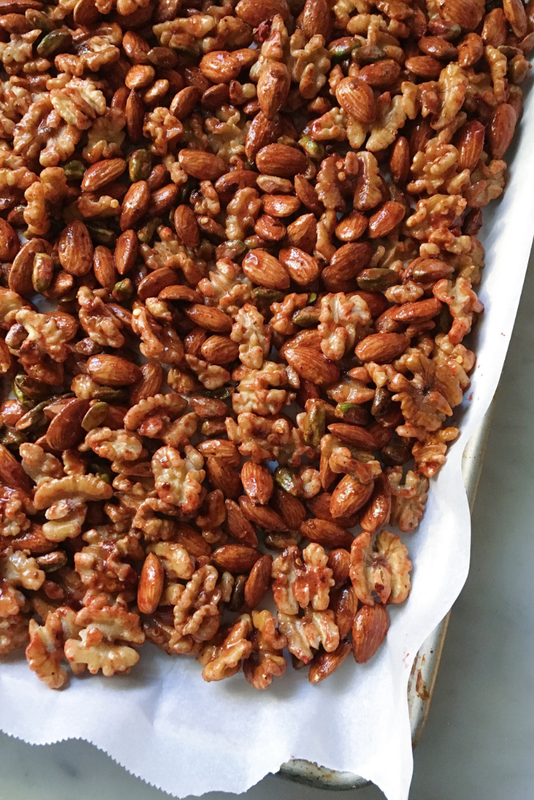 In short, spiced nuts are there for you when need a flavour packed nosh. MEAL PREP TIP: make double or triple (if you have the space) of this recipe and store in an airtight container in the freezer. You’ll have nuts coming out of your yahoo lol. Adhere to the cooking time noted, because your nuts might feel soft as they come out of the oven, but as they cool they will get crunchy and delicious. Over bake and you might be left with a rancid, burned nut taste. Over season. I know this is cardinal sin numero uno in the culinary world BUT you want your nuts to come out of the oven popping with flavour. I’ve made the mistake of tasting the nuts, prebake, and finding them seasoned but when they came out of the oven they tasted bland. So heed this warning and overseason your nuts. Lay them flat and evenly on a baking sheet. If the nuts are crowded they won’t cook properly. Just for nut safe keeping, rotate the pan and stir the nuts halfway through cooking. Lastly, save yourself the clean up and use parchment paper. In a bowl combine all the ingredient and toss to coat the nuts completely. Lay flat and evenly on a parchment lined baking sheet and bake for 30 minutes, stirring and rotating the baking sheet at the 15 minute mark. when I said these nuts are well played as a soup garnish? 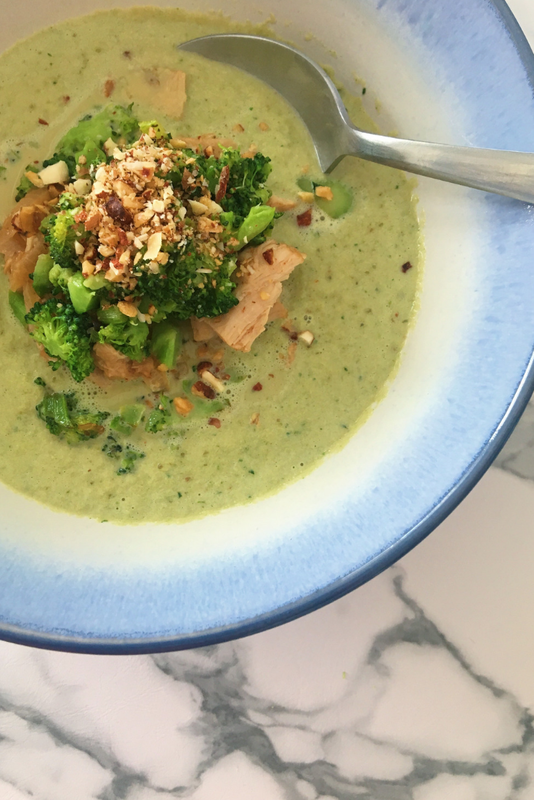 This broccoli chicken soup was divine, but when I added chopped tandoori spiced nuts, HOLY SH*T was all I could say.